Let's not book the Super Bowl yet. Before we book the Seahawks and Broncos their Super Bowl flights to New Jersey, let’s take a moment to look at recent history. Only once in the past 20 years has the No. 1 seeds from the AFC and NFC met in the Super Bowl. That year, of course, was when the Colts played the Saints in 2009. Both Indianapolis and New Orleans are fighting for playoff spots at the moment, and if you look at the past two decades, there’s as good a chance of one of them competing in the Super Bowl as there is for both the Broncos and Seahawks. Denver fans know better. The Broncos came into the playoffs as winners of 11 straight games last season before losing in the divisional round to the Ravens. That loss, of course, came fifteen years after seeing the Jacksonville Jaguars knock them off in Mile High back in 1996. Seattle’s tough to beat at home and the Broncos appear to be in the driver’s seat, but slow down with all the Super Bowl talk. There’s a whole lot of football left to be played. CHEAT SHEET TRIVIA OF THE WEEK: Seattle DE Cliff Avril is one of three players in the NFL with 25-plus sacks and 10-plus forced fumbles since 2011. Who are the other two? Answer at the bottom. Houston (2-10) at Jacksonville (3-9): Are you on this Jaguars train yet? They have won three of four and all without Justin Blackmon in the lineup. Whereas Houston’s season is a lifeless disappointment, Jacksonville’s could end on a happy note. Indianapolis (8-4) at Cincinnati (8-4): The Colts may be 8-4, but they sure aren’t pretty to watch. I got through the film of last week’s win over the Titans, and though a win is a win, it’s hard to see this team doing anything big in the playoffs. I can’t see them going into Cincinnati and beating the Bengals this weekend, either. Cleveland (4-8) at New England (9-3): I suppose Ron Rivera and Bruce Arians are the front runners for Coach of the Year, but how about Bill Belichick? Too boring? Look at this roster compared to last year’s, and then look at the win totals. Somehow, some way, the Patriots never skip a beat. They won’t on Sunday, either. Atlanta (3-9) at Green Bay (5-6): Will Aaron Rodgers play? Will he sit another week? Either way, give me Matt Ryan winning his second straight road game, and going into Lambeau for the Falcons’ biggest win of the year. Harry Douglas is having a career year. Look for another big game out of him. Oakland (4-8) at New York Jets (5-7): At this point can you really pick the Jets against any opponent? The last time Geno Smith threw a touchdown pass was before the start of the World Series. And how’s this for a stat: Ed Reed has not won a single game he has played in this season. That won’t be mentioned in his Hall of Fame speech. Expect an ugly game and a lot of Janikowski. Detroit (7-5) at Philadelphia (7-5): The Lions can put themselves in some pretty good position for the NFC’s No. 3 seed with a win over the Eagles on Sunday. To do so, they’ll have to go into Lincoln Financial Field and get the best of arguably the hottest team in football. They will find a way. Ndamukong Suh, Nick Fairley and the rest of that Lions pass rush will bring Nick Foles back down to Earth. Miami (5-7) at Pittsburgh (6-6): The Dolphins offensive line has played surprisingly well since the Richie Incognito and Jonathan Martin mess, protecting Ryan Tannehill far better than it did when those two guys were in the lineup. Miami’s in must-win mode, but the Steelers don’t give an inch. Ever. Buffalo (4-8) at Tampa Bay (3-9): Coach Doug Marrone’s comments after Buffalo’s overtime loss to the Falcons last week summed up the feelings of all Bills fans this year. Playing close, being competitive and playing close is not what we do. What we’re here to do is to win. At the end of the day we haven’t gotten that done consistently. Another season, another year the Bills will likely be watching January football from the couch. Kansas City (9-3) at Washington (3-9): The Chiefs have lost three straight, but oddly enough, I think they showed me more in their last two games — both defeats — than they did in their nine wins to start the year. This offense can put points on the board, and as they showed versus both San Diego and Denver they can do so in a hurry. As for Washington? I’d say it’s time to look towards May’s Draft, but the team’s first round pick — likely a top-five selection — will go to St. Louis. Minnesota (3-8) at Baltimore (6-6): The Ravens can’t overlook Minnesota, though you could understand if they do. With a playoff spot currently in their hands, Baltimore follows this with a brutal end to the season with games against the Lions, Patriots, and Bengals. This one’s a must. Tennessee (5-7) at Denver (10-2): Peyton Manning isn’t losing to Ryan Fitzpatrick at home. Not with the Patriots just one game behind in that race for home field. The AFC schedule is weak this week when this is the premier game, unless, of course, you’re an NFL Draft fan. Then, Jacksonville-Houston might as well be the Super Bowl. St. Louis (5-7) at Arizona (7-5): Other than their Thursday night loss to the Seahawks a few weeks back, the Cardinals have been unbeatable at home this year. Their five wins in Glendale include victories over the Lions, Panthers, and Colts, all likely playoff teams. The Rams got them in Week 1. They won’t be fooled again. New York Giants (5-7) at San Diego (5-7): Eli Manning and Philip Rivers have been linked ever since being traded for one another in the 2004 NFL Draft. Eli’s got the rings. Rivers has the numbers. The Chargers need this one to stay afloat in the playoff race, but I think Big Blue — coming off a hard-fought win in Washington — plays the role of spoiler. Seattle (11-1) at San Francisco (8-4): Is there such a thing as virtual drool? If there is, I had to spend a few hours Tuesday morning washing my Twitter feed of it after all the love the Seahawks got Monday night. They looked good against the Saints, yes, but they haven’t won anything yet. Let’s save the ‘Greatest Team Ever’ talk to February. I like the 49ers in this one. Carolina (9-3) at New Orleans (9-3): I’ll be at this one Sunday night in New Orleans and can’t wait. The Panthers have won eight straight games, including victories over the 49ers and Patriots, but none of those would be as big as beating the Saints in the Big Easy. New Orleans hasn’t lost at home this year and Drew Brees teams rarely get beat in that building on a Sunday night, but I’m going with the upstart Panthers. Newton is the type of quarterback that can escape Rob Ryan’s pressure and Carolina can handle the noise. I may be the only one going with Carolina in this one, but I’ve been high on the Panthers since August. 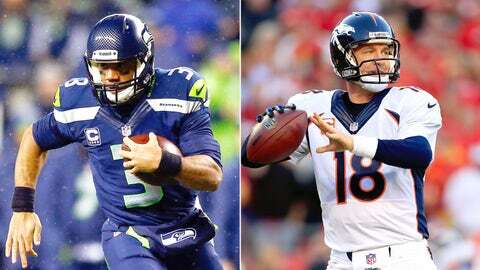 These are the type of games Super Bowl contending teams win and earn third-year stud quarterbacks MVP consideration. Dallas (7-5) at Chicago (6-6): Sean Lee should be back in the lineup, Tony Romo should be able to light up the Bears defense, and the Cowboys always seem to win big games in November and the start of December. They’ll beat Chicago, get everyone talking about a run through the playoffs, and well, have to win in Week 17 to get in like every other year. CHEAT SHEET TRIVIA ANSWER OF THE WEEK: Cliff Avril is joined by John Abraham and Von Miller as the only players in the NFL with 25 sacks and 10-plus forced fumbles since the 2011 season.